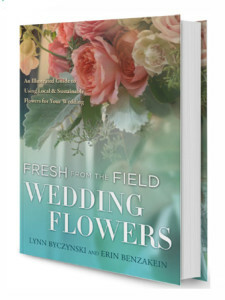 A new book, Fresh from the Field Wedding Flowers highlights the growing local flower movement and includes dozens of photos of wedding bouquets made with seasonal, locally-grown flowers— including a beautiful wedding arbor by Persephone Farm! Written by Lynn Byczynski and Erin Benzakein, the book celebrates the beauty of seasonal and sustainable flowers. From heirloom narcissus, ranunculus and frilly French tulips in the spring to dramatic café au lait dahlias paired with berries and dark ninebark foliage in the fall, the bouquets showcase the floral bounty of each season. Conscientious consumers are increasingly aware of where and how and where the products they buy are produced. For brides and grooms, using local flowers is a way to make their weddings distinct, different and more meaningful. Learn more about Persephone Farm’s wedding flowers. We primarily serve Kitsap County, West Sound including Bainbridge Island, Hansville, Poulsbo, Gig Harbor and more. Occasionally, for large parties, venture farther afield to the Seattle area or the Olympic Pennisula. Don’t miss our photo gallery of Persephone’s beautiful wedding flowers — bridal bouquets; reception decorations wedding arbors, and of course, boutonnieres. Slow Flower expert, Debra Prinzing has great post and podcast about the book.